*some assembly required: 7007 Priscilla is now for sale! 7007 Priscilla is now for sale! Our project at 7007 Priscilla Drive in Austin is now on the market for sale. We're still working on the last details, but this panoramic photo of the living/dining/kitchen areas shows you how bright and spacious this house is. You can find more info about the house on Zillow. 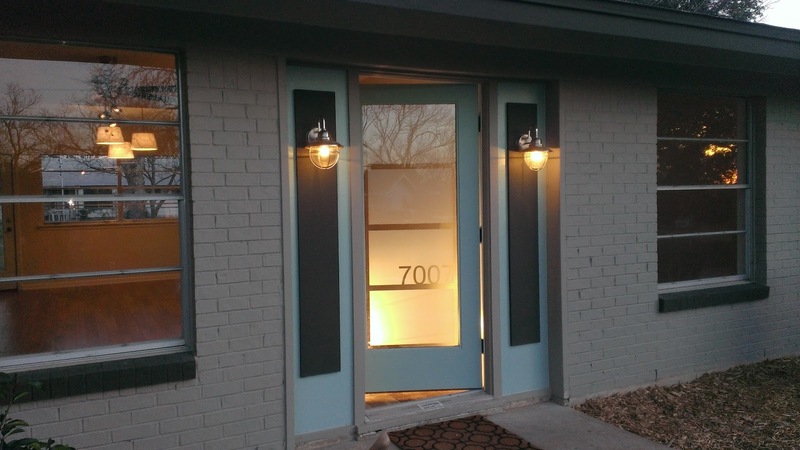 We just finished doing the frosted glass on the front door. Thank you Jonathan from Sunsational Solutions! At the front door, looking through dining room toward kitchen. The back yard is huge! Brand new island kitchen with lounge. The new hardwood floors go throughout the house. Looking out from the kitchen to the huge back yard.